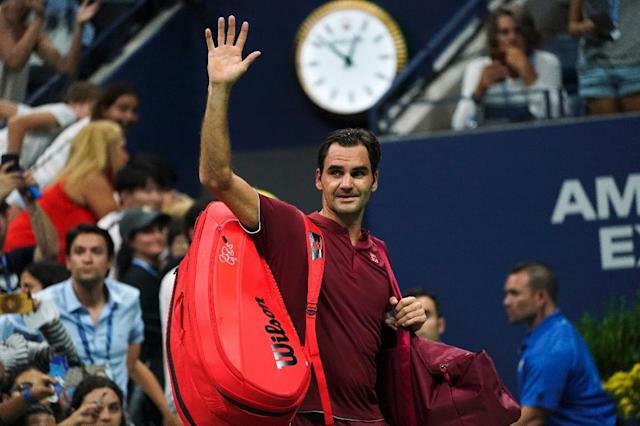 New York (AFP) - Roger Federer surveyed the wreckage of his US Open exit at the hands of John Millman, insisting there was "no shame" in defeat and challenging the wisdom of anybody brave enough to start penning his career obituary. His 3-6, 7-5, 7-6 (9/7), 7-6 (7/3) defeat to world number 55 Millman was his earliest in New York in five years. It was also the 37-year-old's first loss at the tournament against a player ranked outside the top 50 in 41 outings. "It was just hot. No shame there. These things unfortunately sometimes happen," said the world number two after his bid to win a sixth US Open, 10 years after his fifth, sunk in the crushing humidity of an airless Arthur Ashe Stadium. "So, you know, move on and take a rest. Then I come back for the Laver Cup (in Chicago) and hopefully finish the year strong." Monday's defeat followed Federer's surprise quarter-final exit at Wimbledon where he lost 2-6, 6-7 (5/7), 7-5, 6-4, 13-11 to South Africa's Kevin Anderson in a tie where he had a match point. That was Federer's earliest departure from Wimbledon -- where he is an eight-time champion -- since his shock second round defeat against Sergiy Stakhovsky in 2013. But Federer has been here before and defied his doubters. After winning his 17th Grand Slam title at Wimbledon in 2012, he went without a win at the majors for almost five years until beating old rival Rafael Nadal in the 2017 Australian Open final. In between, he had also suffered a third round loss to Andreas Seppi in Melbourne two years earlier. That victory came after his world ranking had slumped to 16, his lowest in 15 years. Since then, he has added the 2017 Wimbledon title and successfully defended his Australian crown in January this year. Put simply, in his last six Grand Slam tournaments he has won three and made two quarter-finals. In February this year, he became the oldest ever world number one. All of the sport's top players have endured slumps. Current world number one Rafael Nadal didn't win a Grand Slam for three years between his 2014 and 2017 Roland Garros triumphs. He has since added the 2017 US Open and an 11th Roland Garros this year, taking his total to 17, just three behind Federer. When Novak Djokovic completed the career Grand Slam in Paris in 2016, he suffered a majors drought which only ended at Wimbledon this year. Federer's many sponsors still have faith in the Swiss legend -- at Wimbledon this year, he penned a $300 million deal with Japanese clothing giants Uniqlo, ending a career-long link with Nike. However, there are still speed bumps that need to be flattened for Federer. If he repeats as Australian Open champion in 2019, he will surpass Ken Rosewall as the oldest ever winner of a Grand Slam title. Monday's loss also exposed new frailties in his game. He finished with 77 unforced errors and 10 double faults and squandered set points in the second and third sets. According to the ATP, he had just 49% of first serves -- his second-lowest in his 98 US Open matches and fifth-lowest in his career 393 Grand Slam matches. His double-fault count was his second-most at the US Open and was tied for third-most at Grand Slams.